I also made a block for our guild’s banner quilt. Have you seen the Central Jersey MQG’s? It’s gorgeous (that pic also includes president Jess). Ours is going to be the colors of our logo– Kona Caribbean, Chartreuse, Bright Pink and Orange. It’s bold, and the challenge was to make a block using this limited palette. Actually, members could only use three of the four colors, with Kona White as the background/neutral. 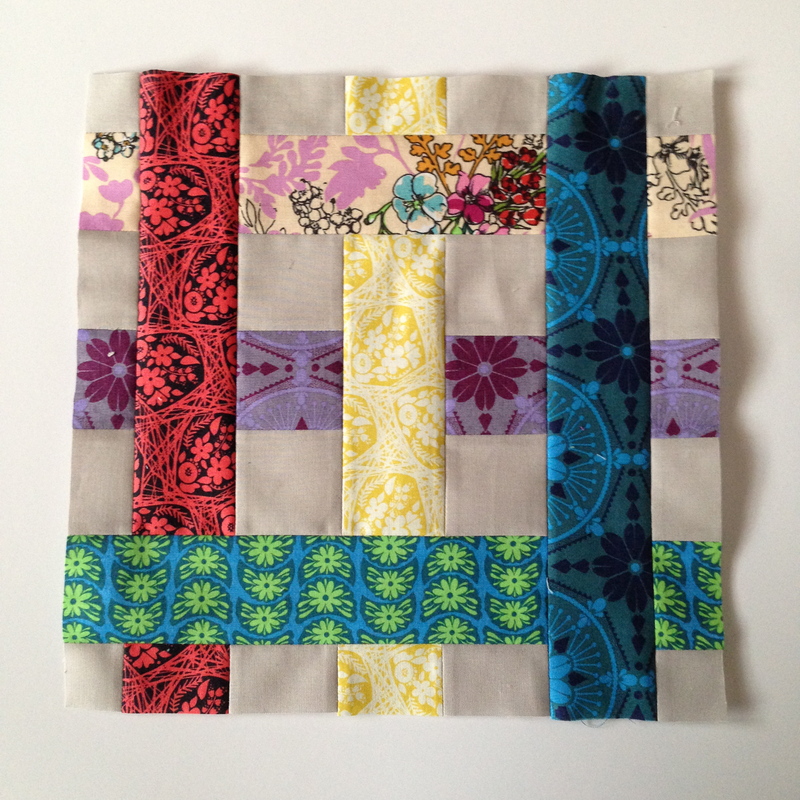 And the assignment was to make a block that signifies what modern quilting means to you. Some geometry, some improv and some wonkiness. I love the continued conversation about what makes a modern quilt. 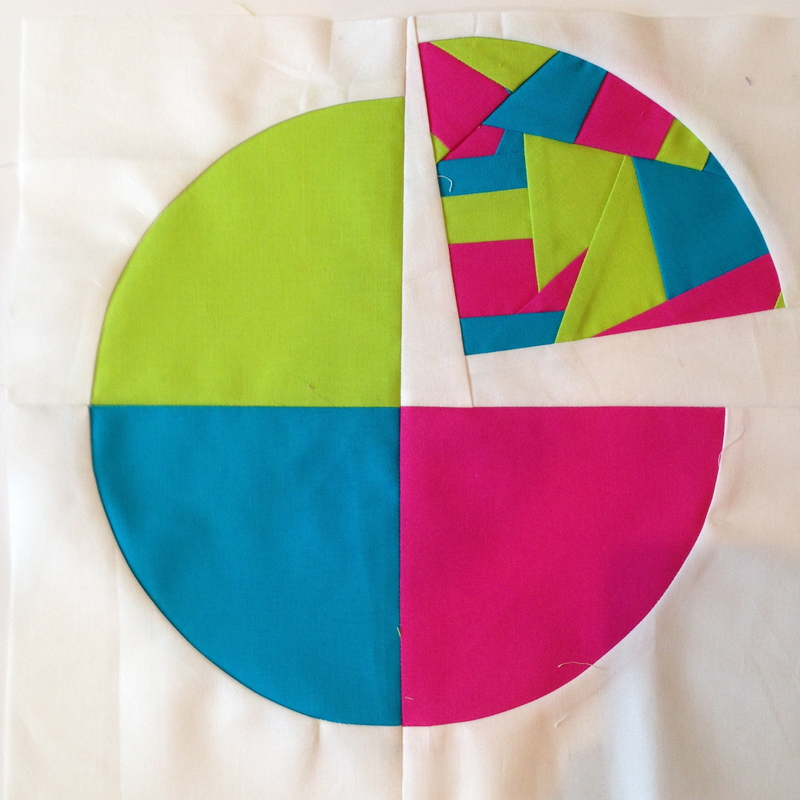 I’ve really enjoyed piecing this week, and I’m learning more about precision and efficiency with every block. I’m looking forward to getting back to my yellow and gray circles this weekend. It’s quilting time for that project. LOVE the bee block. How would you set those? I think they’re supposed to all come together to make a giant basket-weave effect. I’m excited to see how Janita does it. Especially since it’s all Anna Maria Horner fabric. Fun! These both look amazing. Are you feeling a little outdone by that Central Jersey quilt? Or is that just me? Wowza! Love your block for the guild quilt! Thanks, Kim! I’m really happy with how it came out.